Gas is cheap and Americans love trucks, so it’s probably no surprise that sedan, small car and sports car sales aren’t doing so hot. Maybe that’s an understatement, because The Detroit News reports General Motors will idle five plants in the U.S. and lay off thousands of employees. The newspaper says GM’s vehicle inventory at the end of last month, at 870,000 vehicles, was the highest it’s been for the company in eight years. Small cars in particular are sticking around in GM’s stockpile, with The Detroit News saying analysts recommend a 60 to 70 day supply of cars as “healthy,” while GM’s average car inventory is at about 105. ...at the end of November, [GM] had a 168-day supply of the LaCrosse; 177 days of the Camaro; 170 days of the Corvette and Chevrolet Spark; 121 days for the Cruze; 119 days for the ATS; 132 days for the CTS; and 110 days for the CT6..﻿. The result of this surplus, The Detroit News says, will be the idling of five plants in January, namely Lansing’s Grand River plant (which makes the Camaro and Cadillacs CTS and ATS) for two weeks, Detroit-Hamtramck (where the Chevy Impala, Volt, Cadillac CT6 and Buick LaCrosse are assembled) for three weeks, the Lordstown Complex (the home of the Chevy Cruze) for a week, Bowling Green (the Corvette, duh) for one week, and Fairfax Assembly (which makes the Buick LaCrosse and Chevy Malibu) for three weeks. On top of that, GM said in a filing that it plans to cut its second shift at the Detroit-Hamtramck plant, resulting in the loss of about 1,300 jobs. 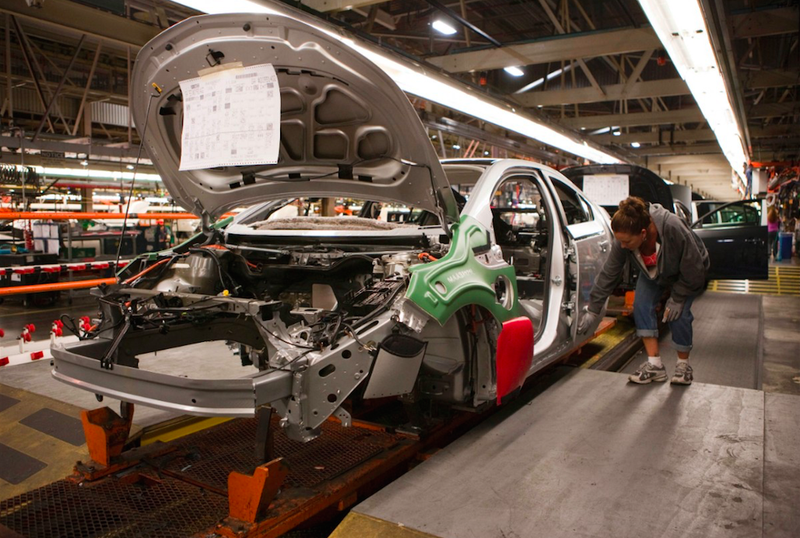 This is in addition to the 2,000 workers expected to be laid off when GM slashes third shifts at the Lansing Grand River Assembly Plant and Lordstown Complex in January. Cheap gas may be driving car buyers away from smaller cars, but with recent talk about president-elect Trump’s policies on fuel economy regulations, these car plants have an even harder future ahead of them.